← Navy and Pink~Taking Winter to Spring! Love the bright colors, the updated contemporary scale of this floral fabric. So chic used on this classic traditional chair! I went shopping with my girlfriend the other night for a dress. The stores are spot on with our sentiments of totally being sick of winter and wanting the bright fresh florals of Spring! They were seen everywhere! I personally am not a floral wearing person, but I certainly appreciated all the awesome uses of it in fashion out there. It was inspiring and refreshing. I came home and started thinking about the jobs I was working on and where I can incorporate all these fun fabrics and still be timeless. The chair in the picture above is a great example of how I can implement it. 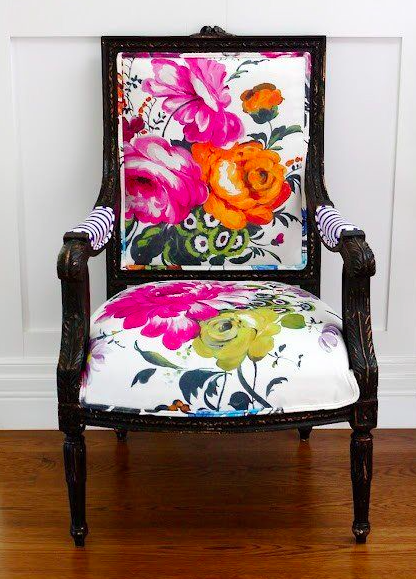 Take a traditional chair, paint it black lacquer and add that bright floral fabric, boom!, you have a terrific focal point and trendsetting item. 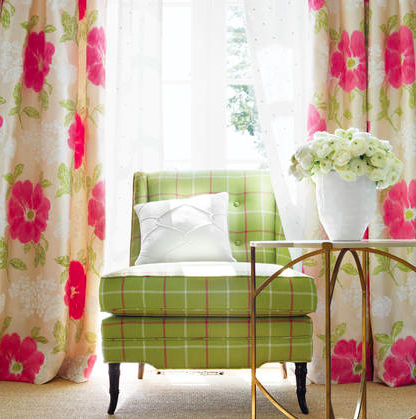 Anna French fabrics and wallpapers are bright and fresh. Anna French has some beautiful fabrics and wallpapers! Here is a wonderful example of taking a classic chair and adding beautiful floral fabric window treatments with bright and easy colors. This is so pretty for a sitting room, conservatory, girls bedroom or woman’s office. I just love the mix of feminine flowers with the more masculine plaid. Let’s not forget to brighten our pets lives too! 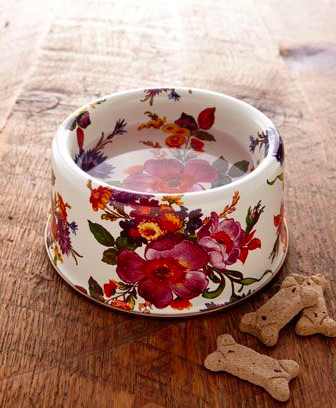 I saw this adorable pet bowl at Nieman Marcus and couldn’t help but share. 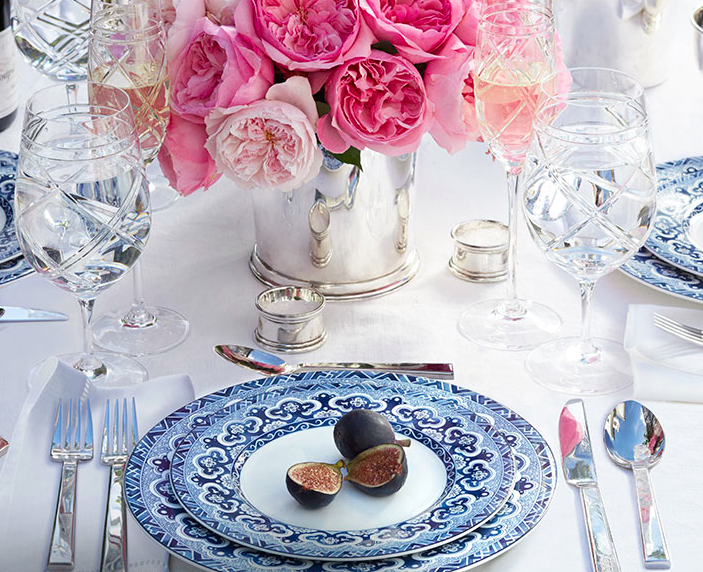 Let’s face it, nobody does elegant floral designs like Ralph Lauren. Everyone who reads my blog, knows I love Navy. Well, Mr. Lauren did it again! I love this table setting. With the pink flowers and silver accents~heaven! I can so see entertaining a Spring Luncheon or Dinner with this setting. While hosting this fabulous event, why not look just as fabulous! This is such an adorable dress and I would match the table, lol! Alright, so maybe I do not want to match the table. This ever so cute muted floral dress at Nordstrom might just do the trick! The back of this dress is just as cute. I love that it is a floral, but not an “in your face” floral. Until the short dresses, I have to stick with jeans and a pop of floral! This scarf does the trick! So cute and a perfect way to take me from almost Spring to Spring. Pair it later with a white dress for Summer. Can you tell, I just can’t wait for warmer weather?